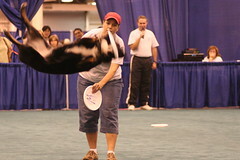 I love this picture from the AKC World Series in Houston last weekend. This dog was amazing. Mainly in the relationship between the dog and the trainer. And yet this post is not about dogs. Specifically I’d like to give props to HorsePigCow for two huge posts recently on marketing. Given I am working on internal training on persuasion architecture they both resonated with me. underrepresented sectors that may not be as ‘big’ but have needs, too. brunette (and redhead and all the other variations of hair colour). The long tail is chunky and has more possibilities than anyone can imagine. If that seems out of context please read the original postÂ with visuals. The second Tara post to highlight was more recent. Watching Anderson Coooper on CNN tonight on the war between Israel and Hezbollah in southern Lebanon. This particular segment was on a tour of the war zone for the cameras led by Hezbollah. In particular Anderson mentioned "volunteers on scooters" who told them where they could, and could not, point their cameras. Think about that. Volunteers? On scooters in southern Lebanon? During a war? WFT? So why? Which made me think of the (again, different animals, just similar economics) section in Freakonomics on Crack Dealers. The premise was it was a pyramid. You participate at the lower levels for a shot at the top. A shot at the big time. A shot at the NBA. A shot at five houses and "the life" if you win the reality television show. In fact those at the top were obligated to live the life or those at the lower levels lost incentive to compete. A competitive pyramid. McDonalds pays more than the lower level crack dealer makes. And entry level positions actually PAY to be guardians. Why would you PAY to be a thug with the greatest chance of being arrested and the lowest income level, or even a negative income level to participate? That is the part of Freakonomics that twists reality by explaining economic reality with no alternatives. The economics are known. Create an alternative. You don’t have to agree or disagree, but I do suggest reading Freakonomics before commenting.